In India, Winters call for pure indulging dishes. 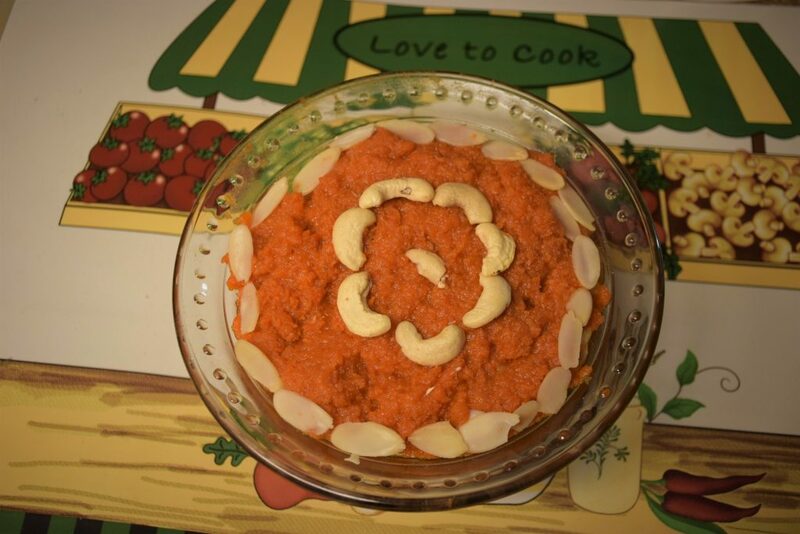 One such family sweet Dish is “carrots pudding” or Gajar ka Halwa. 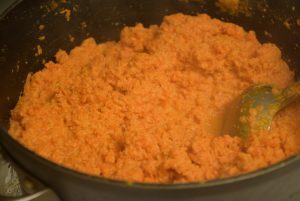 After coming to US , I realized that we could no longer relish the same exotic red colored Halwa here, since the carrots are orange in color. 😉 But then, I read somewhere to add a little Beetroot to balance the color and taste , and really till date I couldn’t find any significant difference in the taste or aroma after adding it. 1. First of all we peel our carrots and beetroot and wash them in fresh running water. Its better to use a food processor or a machine Grater to grate all the carrots in medium size shreds. So depending on the capacity of your machine it could take from 10 mins to 30 mins. 2. 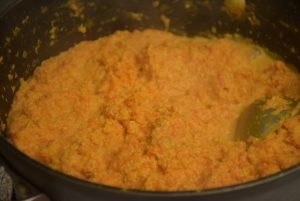 The conventional method says to add the shredded carrots and beetroot in a big size (5 quart) wok with about 2 litres of milk and bring them together to a quick boil on medium-high heat. But to save time ,effort and energy, I simply tossed these shredded carrots, beetroot and just 1/2 cup milk in pressure cooker and heat it. After 1 whistle on high, I turned off the heat. 3. 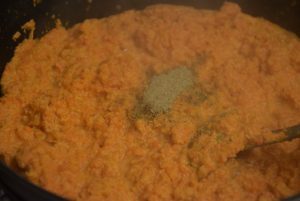 Once the pressure is released, I added this milk-carrot mix in a big wok and now added the remaining milk and turn the heat to medium. Cook it uncovered or with a net. 4. After about 15 mins, I turned the heat to simmer ,i.e., less than medium (on no. 2 of my knob) and let it cook uncovered or with a net to help evaporate all of the milk from it. You may have to stir the mixture from the base to avoid sticking at the bottom or getting burnt. 5. After about another half an hour, when I saw the mixture is bubbling heavily without any milk I lowered the heat further. From now on, keep a close eye, and as soon as the liquid is all dried up from the wok, add the required sugar to it. Stir well everything till it is incorporated well. 6. 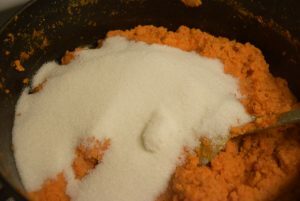 Now sugar will again ooze out some liquid in the carrots, so let them dry out first on low heat. 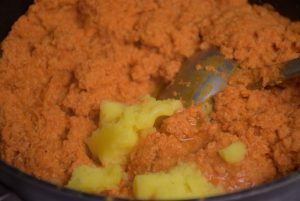 Once the mixture is dried again, then add the crumbled or grated Mawa to it. Mix it well with the spatula. 7. Now add the ghee( clarified butter) and mix it continuously. Also add the nuts like cashews, almonds, raisins as per your choice. You may also add melon seeds (kharbuje beej) to it. Mix them well in the hot Halwa. 8. 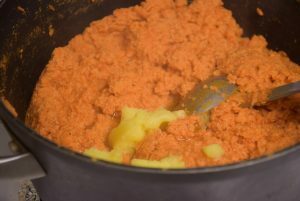 Once the ghee is mixed and you could see enough ghee to move the Halwa freely in the wok turn off the heat. Now add the cardamom powder and mix it well. 9. The lip-smacking Halwa is ready to devour!! 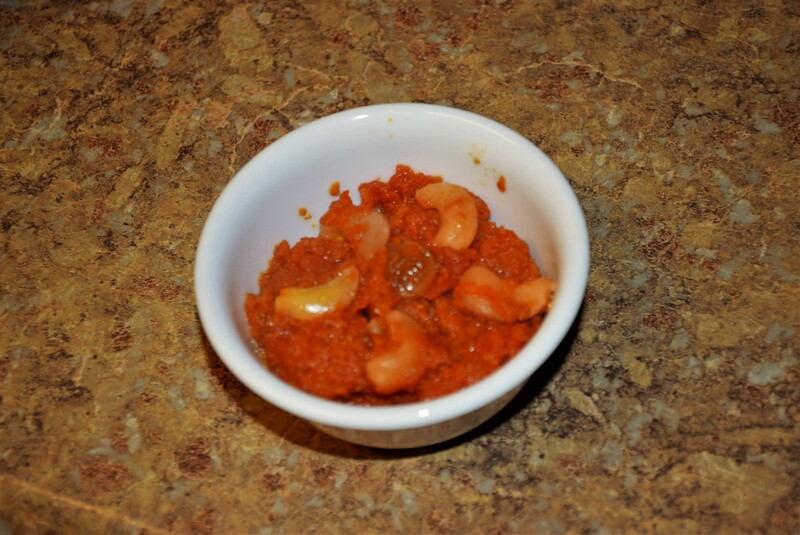 Enjoy winters with this hot ,healthy Gajar Halwa !! You may garnish it with more nuts while serving ! Warm it in microwave for a few seconds just before serving ! It tastes best when served hot ! Welcome winters with this hot veggie-dessert ! A very Happy New Year to all my readers! Keep writing to me in the comments below . Please feel free to give me any suggestions if you feel like! 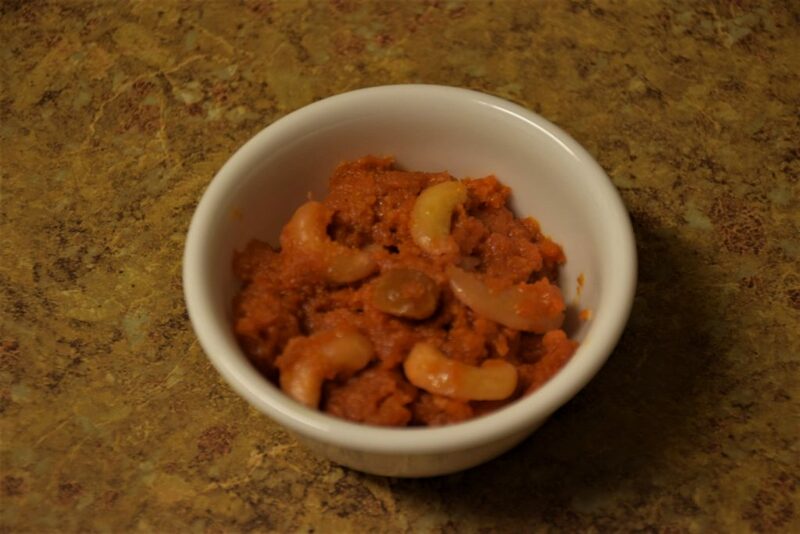 This entry was posted in Desserts, Diwali Delicacies, Food, Recipes and tagged Carenshare, carrots fudge, Carrots pudding, Gajar ka Halwa, healthy bones, healthy eyes, hot dessert for winters, Indian Dessert, Iron, North-Indian, shweta jindal, sweet, veggie dessert, vitamin A, Vitamin K, zindagisikhati.